Christian Dior is known for lady-like structured pieces which are especially shown in the Lady Dior Collection. This designer bag is no exception. 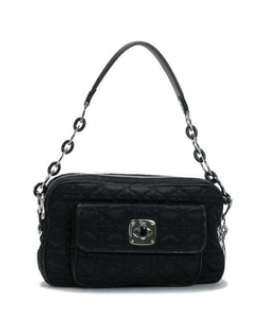 This structured shoulder bag in gorgeous black satin and black leather accents features cannage stitch detail and a chain-and-leather shoulder strap. This handcrafted piece will be quickly become your favorite designer piece. Made in Italy.